גוש כסף של Engelhard משקל 100 אונקיות These vintage bars haven't been produced since the 1980's! Since the development of the physical silver investment market in the early 1970s, Engelhard 100 oz 999 fine silver bars have been among the more popular silver bars because Engelhard Mint was a major player in the precious metals industry. 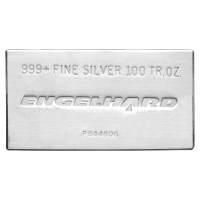 The first Engelhard silver bars were the poured 100 oz bars. As demand grew, however, Engelhard went to an extrusion process, which lowered manufacturing costs. The bar pictured is the latest version of Engelhard extruded bars. The Engelhard hallmark, the description, and the identification number are recessed, having been stamped on the bars. Both styles of Engelhard extruded silver bars measure 5-7/8" X 3" X 1" and weigh 6.86 pounds on a bathroom (avoirdupois) scale. Because of their uniform sizes, Engelhard extruded silver bars stack and store easily. Which makes this item especially nice for the larger investor. Engelhard is one of the most highly respected names in the precious metals industry, causing many investors to ask for only Engelhard bars.